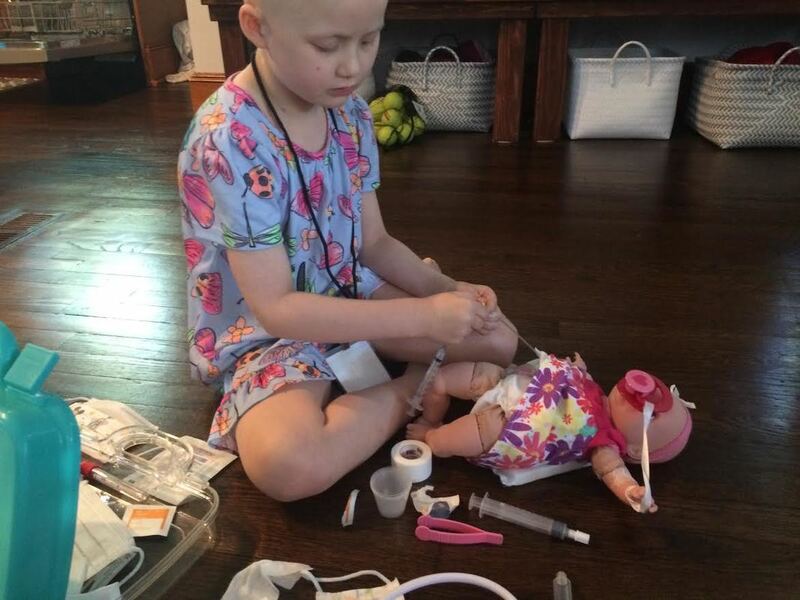 When a child is diagnosed with cancer they either have a port (aka: port-a-cath, central venous catheter), or a broviac (a long term central line) surgically placed which is used to administer their chemotherapy, blood transfusions, fluids, etc. To help ease the child’s anxiety of being "accessed" we send them (children 4 years and older) a personalized Lovie Buddie which not only has a port just like them, but it also comes with a medical kit filled with the same “safe” supplies that are used on our kiddos fighting cancer. Due to overwhelming requests for our Lovie Buddies, as of 3.13.19 we are temporarily pausing our program while we transition to a more efficient system for handling the Lovie Buddies volume. While you can still request (or sponsor) a doll via either of the below "buttons," please note that we will not begin fulfillment of new Lovie requests until May 30, 2019. As you may already know, we're a small volunteer run foundation doing our best to help as many children as possible, so we thank you in advance for your patience. Moana post surgery. We had to wrap her in bandages to ensure that her port wouldn't shift. After 3 years of being cancer free, 6-year-old Faith is currently back in treatment for relapsed wilms tumor (a form of kidney cancer). When we heard that she loved Moana, we knew exactly which Lovie Buddie to send Faith's way! Sponsor a Lovie Buddie today!! Forever 6-year-old Mia McCaffrey plays with her Lovie Buddy. Lovie Buddies where they are massed produced, so for now they’re being assembled to order which gets a little pricey between the cost of the doll, medical supplies and shipping fees. While any donation towards our Lovie Buddies helps, to sponsor a doll in its entirety we ask for a $50 donation. The best part is that 100% of your donation will go directly towards these dolls! Request your child's Lovie Buddie today!! Click Here to Request a Lovie Buddie! Cancer fighter Sammy loves Marshall! Marshall post port placement "surgery."